Find the best deal and the perfect Stansted airport hotel with AirportHotels.co.uk. Compare the nearest and best Stansted hotels and save up to 60%. Travelling to the airport for your holiday can be a stressful experience. From early morning flights, to traffic jams and congested motorways, this can dampen some of the excitement of your trip abroad. Take away some of that worry and get your trip off to a relaxing start by booking a hotel at Stansted Airport? Why choose a Stansted Airport Hotel? With a big variety of hotels to suit all budgets, hotels close to Stansted Airport are more affordable than you may think. If you combine a hotel and parking package, you can make an even bigger saving, plus be safe in the knowledge your airport parking is taken care of too. By booking your airport hotel with us, you will be able to enjoy a relaxing evening and a good night's sleep knowing that you won't have a long journey to the airport on the day of your flight. In the morning, you can enjoy a tasty breakfast and then make the short trip to the airport terminal ready to check in for your flight. We have done all the hard work for you to make your booking process as hassle-free as possible. 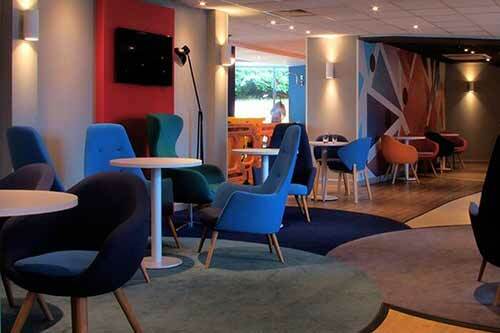 We have reviewed and selected the top Stansted Airport hotels to bring you the best savings. Whether you are travelling with family, as a couple or for business, we will have an option to suit your needs. To make life that bit simpler for you, we're going to show you five of the best Stansted Airport hotels for 2019, and let you make your choice from there. 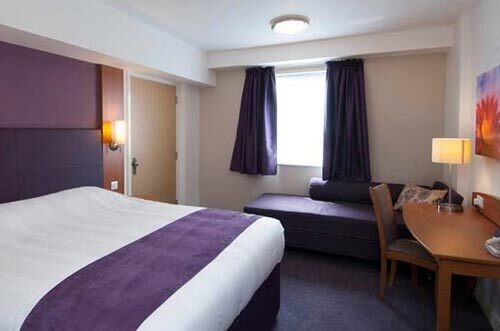 The name Premier Inn is synonymous with great comfort and value for money. As the UK's top-rated hotel chain, you know exactly what you are getting. You can be assured of a comfortable, well-equipped room and an excellent breakfast, as well as the Goodnight Guarantee to ensure you have a good night's sleep. 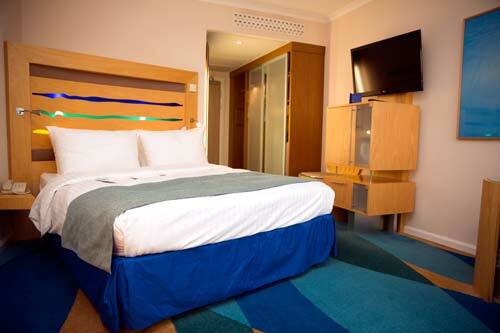 At just 2 miles from the terminal, this hotel is ideally located for Stansted Airport. A shuttle bus runs every 30 minutes and costs £3 per adult with children travelling free. What's great about the hotel? The Thyme Bar and Grill is the hotel's on site restaurant and serves the great value Full Premier Inn Breakfast with the all you can eat freshly cooked hot selection. As well as this, there is also a tasty Continental selection with fruit, pastries and cereal. What's more, up to 2 children can eat breakfast for free! You can also enjoy dinner in the Thyme Restaurant, which serves a variety of traditional and international dishes, all at good value for money. There is also a separate children's menu with all dishes offering at least one of their five a day. Who should book this hotel? The Premier Inn is an all-rounder type of hotel, and its proximity to Stansted Airport makes it a great choice for both couples and families alike. The flexible room options, as well as the great meal deals for children make it an ideal budget-friendly solution for families. 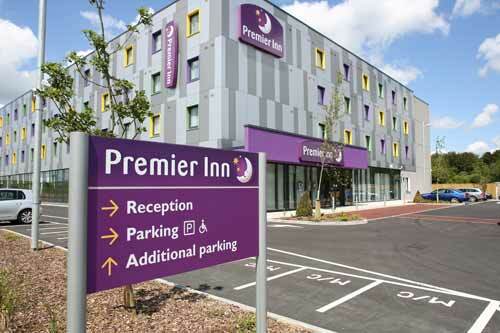 The Premier Inn is located one mile away from the airport itself, with easy access by road. There are facilities for private parking on site, and this costs £8 per day. You don't need to reserve this facility. 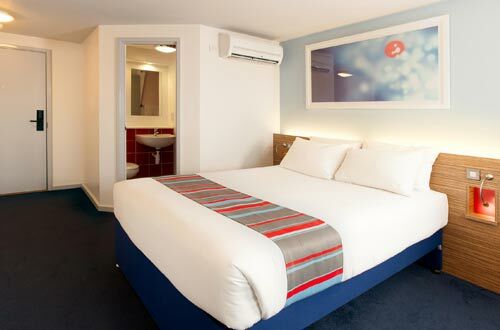 As another large chain, Travelodge has a reputation for being both budget-friendly whilst providing affordable comfort. The Travelodge hotel at Stansted is located around one mile from the terminal building, so you can relax safe in the knowledge you won't be late for your flight. There is parking at the hotel, but this is available on a first come, first served basis and only for the duration of your hotel stay, rather than airport parking. 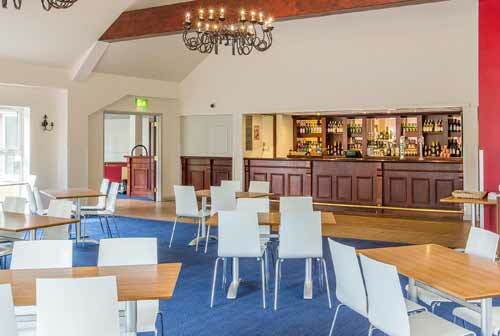 The on site restaurant provides an unlimited cooked breakfast for just £8.50 per head. It is also has great value lunch and dinner menu with meal deal options available. The menu offers a mix of family favourites, including burgers, pizzas and salads. This hotel is ideal for couples or for friends heading away on holiday. It would also suit families with children, as family rooms are available 1 or 2 to 2 pull out beds sleeping up to 2 adults and 2 children. The hotel is located around two miles away from the airport and a shuttle bus runs every 30 minutes to the airport terminal. Fares for this cost £3 each way and free for children. Parking is available on a first come, first served basis, and is limited. Parking is only available for guests whilst they are staying in the hotel at a cost of £8 per night. You cannot book long stay parking or park and stay packages at this hotel. Holiday Inn Express is a slightly smaller version of popular and larger Holiday Inn chain, but still offers all the fantastic facilities that the hotel is renowned for, whilst being a budget friendly option too! This Stansted Airport hotel is ideally located, just a 5 minute shuttle ride from the departure terminal. It also has secured parking, a gym and a sports bar. And if that wasn't enough to tempt you, breakfast is also included in your room rate! If you have an early flight, then you don't need to miss out as breakfast is served from 4.00 am daily. This is available as a cooked buffet featuring beans, scrambled eggs and sausages. The restaurant is open for light snacks throughout the day and for dinner from 6.00 pm to 10.00 pm daily, serving a varied menu and vegetarian options. There is also an outside seating area, as well as a sports bar with 6 TV screens. 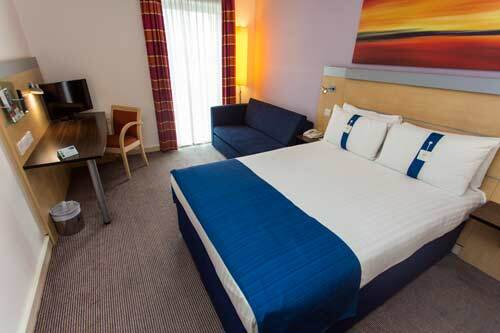 The Holiday Inn Express at Stansted Airport would suit all types of travellers because it offers great value for money whilst offering a range of on site facilities. It is particularly suitable for families because of the flexible room options. The hotel is located five minutes' shuttle ride away from the terminal building. There is private parking available at the hotel on a first come, first served basis, and this costs £12 per day. Reservations are not possible. Formerly the Hilton, the 4-star Novotel Hotel is ideally located for Stansted Airport as is only 6 minutes' away from the departure terminal via the shuttle bus. Offering spacious, contemporary rooms, as well as an on site fitness centre, this hotel gives you a bit of well-earned luxury to unwind in before you fly. The hotel has a very stylish restaurant serving a wide variety of international dishes prepared with locally sourced and fresh ingredients seven days a week from 5.00 pm to 10.00 pm. If you fancy something lighter, then the hotel bar and lounge are open from midday serving a selection of snacks and beverages. In warmer weather, you can step outside and enjoy the bar's outside terrace. There is also 24-hour room service available. This hotel is ideal for business travellers, families and couples because of its close proximity to Stansted Airport and excellent facilities. Located six minutes' drive away from the airport terminal, connected by regular shuttle buses for which a small fare of £3 each way per adult. Park and stay packages are available at this hotel. Overnight parking is charged at £8 for the first night and then £15 per night thereafter. For those who want a bit of pre-holiday luxury and right in the heart of the action, the Radisson Blu offers the best location of all the hotels close to Stansted Airport. 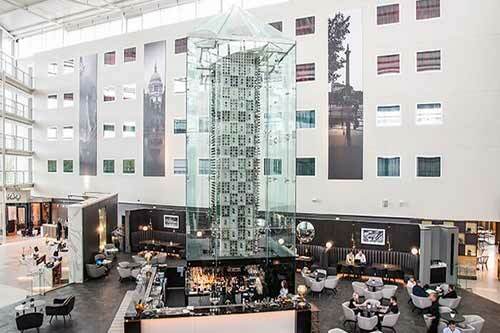 This 4-star hotel has 500 soundproofed rooms, many of which have views of the actual runway! 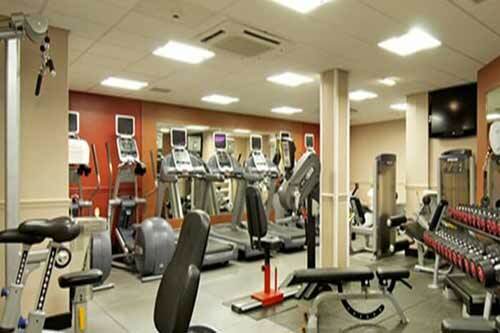 It also boasts a wide array of facilities, including a fully-equipped gym and an indoor swimming pool. One of the advantages of being a large hotel is that there are 2 restaurants to choose from! 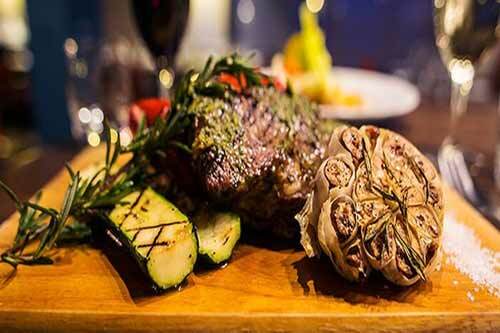 If you fancy classic British fare, then head for the Collage Restaurant which is open from 6.00 pm to 10.30 pm daily. If you are after a more sophisticated dining experience, then the Station 169 is the choice for you. It offers a fusion of English and American flavours and is open from 6.00 pm to 10.30 pm Monday to Friday. Light bites are also available from the hotel's bar menu. A super breakfast buffet is available in the Collage restaurant from 4.00 am to 10.30 am on weekdays and from 4.00 am to 11.00 am at weekends. Couples will benefit most from the on-site facilities, although the option of flexible rooms and the evening entertainment means that it would be suitable for families as well. This hotel would suit anyone looking for some pre-holiday pampering before they fly. Just 2 minutes' walk away from the terminal building! Parking is available at a charge of £10 per day and does not need to be reserved. Reassuringly close to the M11, Stansted Airport is easy to reach from either direction. All of our Stansted airport hotels are within nine miles of the terminal building, offering you plenty of quick conveniences when its time to head for check-in. If youre going to be arriving by public transport, its easy to reach the hotels from the train station or by taxi. Stansted Airport rail station is under the terminal building, offering guests direct access to and from central London and Birmingham. Several of our hotels offer park and stay packages for the duration of your holiday, offering you both convenience and peace of mind. The Stansted Novotel's 4-star service extends to its on-site parking, providing a hassle-free way to start your holiday . Other hotels can be booked with parking at Stansted's Long Stay car park, which is a great option if you would like to drive home straight from the arrivals lounge. Our Stansted airport hotels with parking provide transfers to and from the airport, with times and prices varying by location.